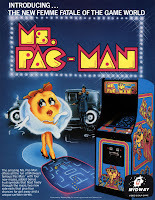 Ms. Pac-Man another unmistakable recognizable gaming character at over 30 years old still continues to become staples in peoples video game collections. Although Similar to Pac-Man; In Ms. Pac-Man you have the fruit that jumps around, in addition to 4 ways to pass through and escape the maze as opposed to Pac-man's 2 ways. 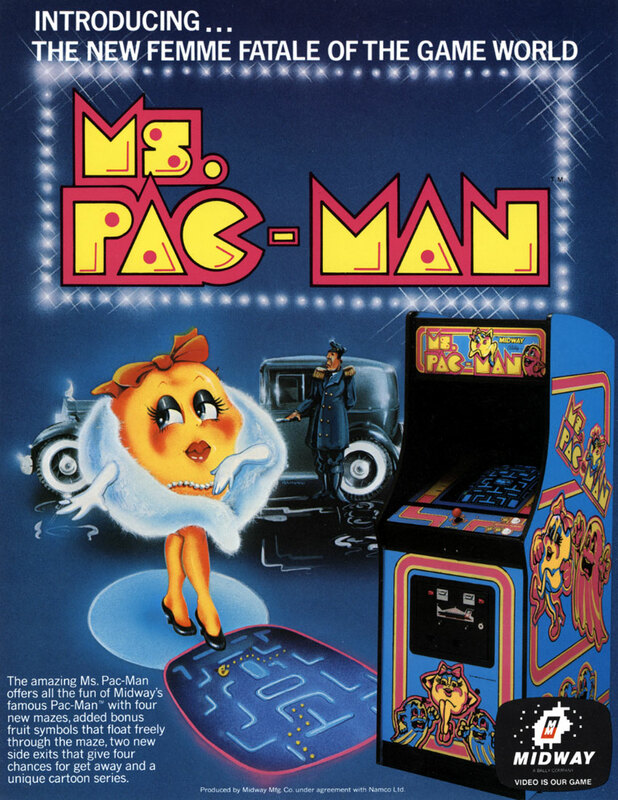 Ms. Pac-Man In my opinion is also better because you get different mazes after every few screens. I also tracked down this game locally on craigslist. Being that the game is so popular and common most likely on any craigslist you will find some form of a Ms. Pac-Man cabinet. Sometimes you might see multicades, or conversions, cocktails, cabarets (mini), and of course the traditional upright. 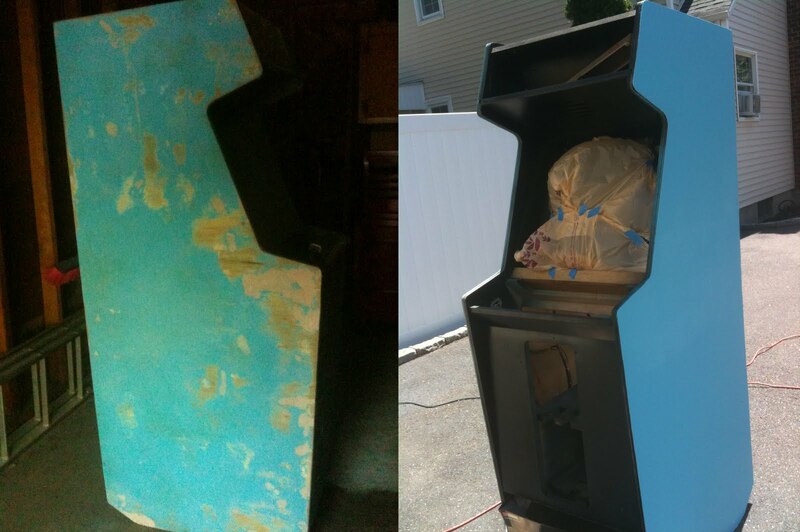 I was able to track down an original cabinet in fair cosmetic condition but it was in non-working condition. I was happy because I knew that would keep the cost down and I would be able to fix it eventually. The first thing I did was tested the Ms. Pac-Man PCB inside my Pac-Man cabinet since it shares the same pinout. I had the RSOD, also known as the Red Screen Of Death. So the guy I bought my original Pac-Man PCB i had sent this one out to be repaired for a very fair price. Although Typically working replacement boards go for around 50-90 shipped. I wanted to keep my original board inside the cabinet since all of my numbers matched. While the board was being sent out although the cabinet was in fair condition, I wanted to sand it down / fix any wood issues / repaint. The coin door had the typical lock bars installed at some point it was obviously a game that was "on location" earning money. So I used bondo to fill the holes and smooth / sand it down. Once the cabinet was sanded down I applied primer, and painted the cabinet using the above color code from home depot. Other pictures below showing the painting progress. 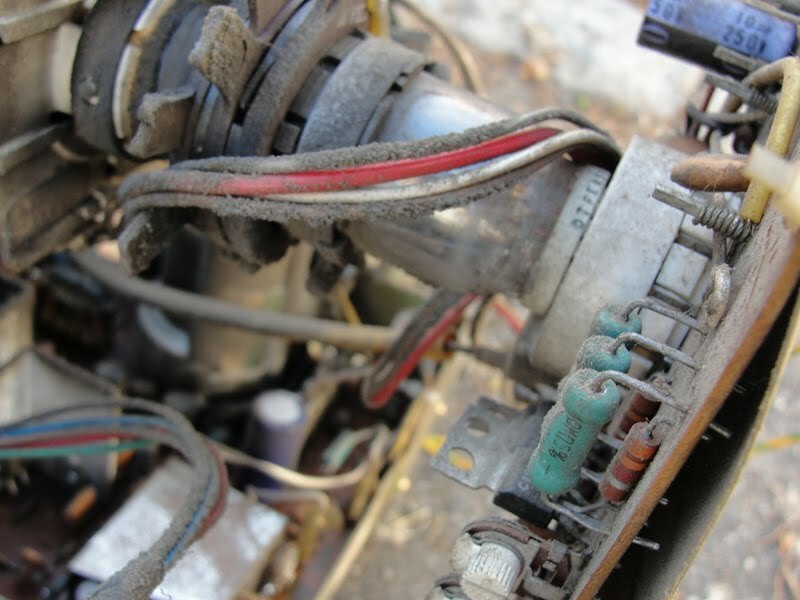 It had an original G-07 monitor inside the cabinet, I noticed a blown fuse, I wasn't sure what the condition was with the monitor so I decided to clean / wash it to get rid of 30 year old crud that had built up around sensitive parts. Temporarily I replaced the monitor with a virtually new burn in free Wells Gardner. Below you can see the before and after pictures of the original G07, down the road I will replace / fix the chasi and possibly re-cap, new flyback fix the original monitor. down the road I'm sure I'll utilize it as the CRT monitors are getting harder to find. I found a great deal on a burn in free CRT Wells Gardner which when I installed noticed an error with scrambled lines saying "Over Range". I Googled and came up with a .pdf fix from Wells Gardner claiming to hit the OSD button on the remote board and lower the contrast / brightness which should fix the issue. The only major problem I noticed was that my remote board didn't seem to function with the "Over Range" error on the monitor. So I asked the seller what the cause was. He said to cut the middle wire on the three prong sync molex. I felt like Macgyver and wanted to make sure I wasn't going to cause any further damage. Reluctantly I ended up saying oh well and just cut it, sure enough that fixed the "Over Range" Issue and the Wells Gardner Monitor looked fantastic ! Finally the game wasn't playing blind and looked great. Above you can see that Pac-Man and Ms. Pac-Man were meant to be together! Below is a video of the game running. While recording I got a blue maze to start level one which doesn't happen that often. After the death of Ms. Pac-Man towards the very end of the video you can see the maze change back to it's more common / traditional color for level one. "The origin of this bug is in the original Pac-Man code. There is a subroutine which controls the flashing energizers in the attract mode of Pac-Man. Normally, this subroutine is only supposed to run during the introduction screen where the ghosts are introduced by name. On some occasions, when the player dies, this subroutine gets called, which flashes the 2 screen location where these energizers are located. When it is called in Pac-Man, it causes the disappearance of the dot that is 2 to the left of the starting point of Pac-Man in the maze. 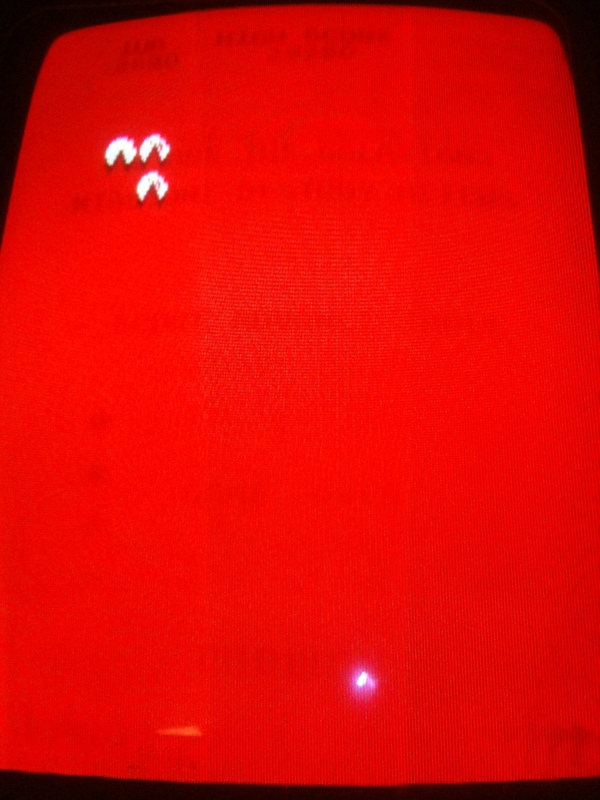 The other screen location that is affected is already blank, so the changed color has no visible effect there. In Ms. Pac-Man, it causes 2 screen locations to change color, which affects the different mazes in slightly different ways. For the first maze, this same dot to the left of where Ms. Pac-Man begins changes color to pink. Like in Pac-Man, the other screen location that is affected is already blank, so the changed color has no visible effect there. For the second maze, two locations are affected. For the third maze, only one location is visibly affected. For the fourth maze, two locations are affected. In any case, this bug is very difficult to spot because usually the anomalies are covered up by a screen refresh almost immediately after they are created. The exception to this rule is during the demo mode of Ms. Pac-Man. If you watch the demo long enough, eventually you will notice that the dot in question is colored pink on rare occasions after Ms. Pac-Man has died during the demo, and it stays pink on screen long enough to be easily observed." ***Adding to this post: I noticed during game play that the game seemed rather difficult. The Ghosts were not staying blue for that long. I was able to compare this against my MAME machine and my suspicions were correct. No dip switch settings on the actual PCB existed to change the difficulty or the ghost timing so after more research I was able to come up with a solution. Basically "There are 2 small solder pads near the DIP switch bank, right next to it is resistor pack RM6, the 2 pads are located just past the end of RM1 (by DIP switch see if they are jumpered". Below is a picture of my board set and the cause of making the game more difficult or rather the ghosts changing quickly from blue back to normal. You can see the glob of solder right above RM6 (above and slightly to the right of dip switch bank), after I De-soldered that glob my game was playing as it should! hopefully this helps anyone else who thinks that their Ms. Pacman PCB seems like the ghosts are changing back too fast. Just in time for fall 2011 with Halloween right around the bend, comes another ghoulishly great platformer from Capcom - Ghosts 'N Goblins. The game was distributed by Taito America, as well as Romstar. 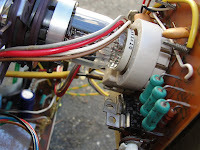 The game was distributed in two ways; sold as a kit with a generic romstar overlay, button stickers, pcb, marquee... However some did come in dedicated purple Taito cabinets. The one I was able to track down was in the original dedicated purple cabinet which was in great shape. It's one of the heaviest cabinets in my entire collection. The game is pretty simple you play as "Sir Michael" according to my bezel, I always thought it was "Sir Arthur" trying to rescue the princess from the devil. 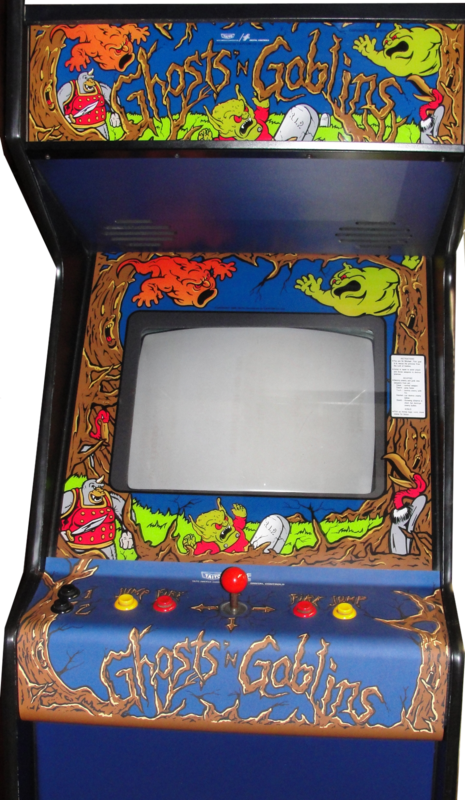 Throughout the game you battle ghosts, goblins, birds, zombies, plants, just to name a few. You have a spear to start out with and are allowed to get hit once while you have your armor on, if you get struck you are reduced to running around in your underwear. Throughout the game you can pick up other weapons; a knife, shield, fire, axe etc.. Although only 6 stages exist in the game it's HELLishly difficult. This particular cabinet eluded me for a long time. Despite the fact that I think the game is extremely difficult something about it keeps pulling me in. Maybe the catchy music, possibly the cool art or perhaps the fact that it's so impossible leaves me reaching for more quarters in my pocket. I saw an ad posted on craigslist for one out of state in CT, I drove with another local collector friend from NY to see it. When we got to the guys house he said he made a mistake and didn't have the game ?! Another one I saw was posted for sale in Florida but the shipping killed the deal, and I once again couldn't justify paying for the high shipping costs. Finally the same local collector who I went to CT with had one in his collection that he was willing to part with. I had helped him move his 32 games into storage locally and he said I can have it whenever I wanted to pick it up, so I couldn't pass up the opportunity. The game was also ported onto many other home consoles that you might remember playing those versions. It made it's way to the following systems ; Sinclair ZX Spectrum, Amstrad CPC 464/6128, Atari ST, IBM PC, Commodore 16, Sharp X68000, Nintendo Game Boy Color, Game Boy Advance and the NES, PSP, as well as the Apple Iphone. 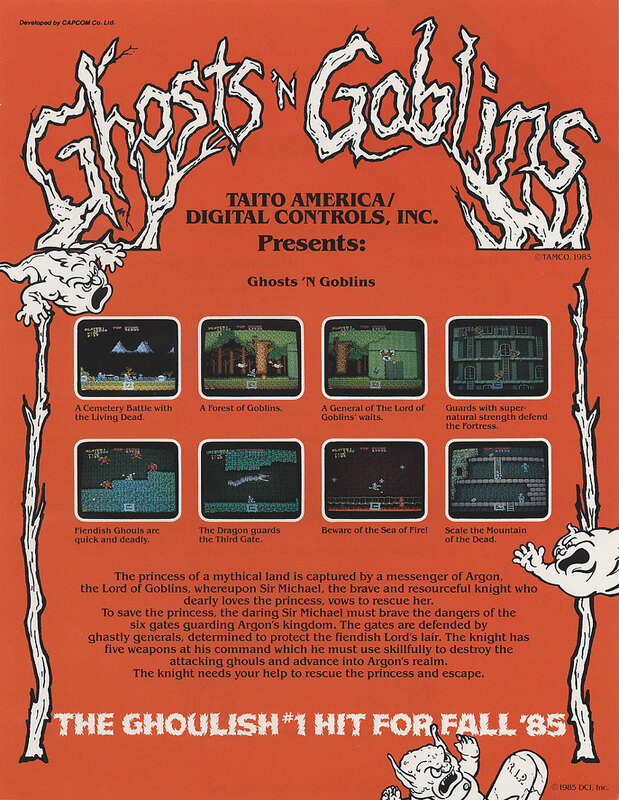 The game 3 years later had what some to consider a sequel that rivals the original and that's called "Ghouls N Ghosts". The sequel Ghouls n Ghosts had majorly improved graphics, you could fire up and down with your weapons and had a golden armor suit that had a special weapon to name a few. I might down the road purchase a JAMMA switcher and have both PCB's inside the cabinet. 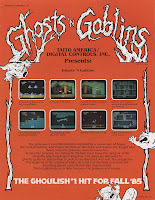 But one things for sure I'm happy that I finally found and added Ghosts 'n Goblins into my collection. The game is in great original condition. Bezel looks near perfect, marquee looks great, control panel looks great with the exception of the joystick needs to go into the chuck of my drill for cleaning. I'm not sure if they originally planned this but I like how the instructions on the bezel are just illuminated enough from the light from the marquee coming through the speaker grill for you to read when the lights are all off. "One day... 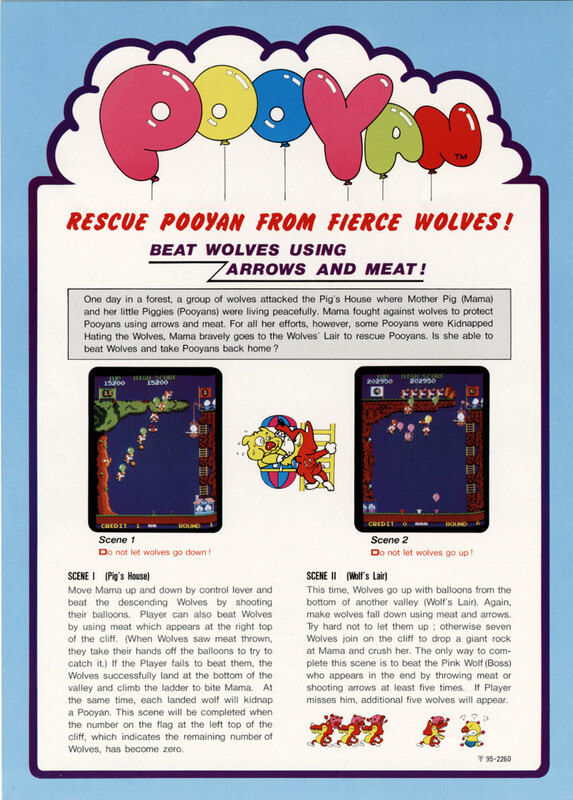 In the forest..." Konami made Pooyan and distributed the game to Stern in 1982. In the game your object is to pop wolves balloons with arrows or meat. The game play is for the most part simplistic but as you advance through more levels you begin to realize just how insanely difficult this game gets. When you first start on level one the wolves begin to fall down, and if you miss any of them they will begin to climb a ladder trying to grab you. Every once in a while you will notice other items being tossed down such as strawberries, apples, etc. Hitting the various items that come down will yield you points but could potentially get in the way of you popping a wolfs balloon. The wolves also block some of your arrows, but they can't block the meat you toss at them which randomly appears at the top for you to grab. Also some of the wolves will toss items at you which you can either dodge out of the way, or hit it for points. 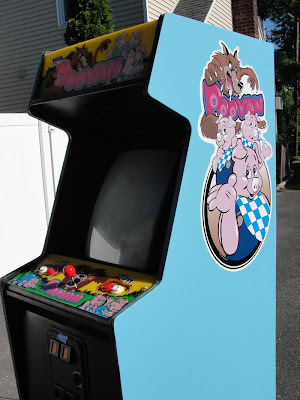 I was looking for a Pooyan cabinet for a long time. Throughout the years I gathered up various parts for the cabinet knowing possibly someday I might track one down. The cabinet also is shared by Stern's Bagman, as well as Minefield. While browsing craigslist one day I saw a "commando" inside what would I knew was put into a Stern cabinet. I immediately called to see if the cabinet was still available, to my surprise it was. The cabinet was listed as working, with no photo's of the side of the cabinet I asked what the colors of the side were which would likely tell me if it was a Pooyan (Blue) , Bagman (Yellow) or Minefield (Red). He had said the cabinet was "yellow" which to me indicated 99% it was a "Bagman" cabinet. I still insisted on checking it out. 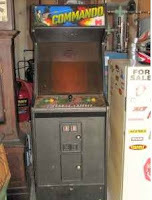 This is the image from the ad on craigslist, showing commando inside the Stern cabinet : As I was inspecting the cabinet I asked to see the inside, to my delight the inside had blue over spray from the Stern factory, indicating to me that this was originally a Pooyan! The seller said ; "you know what I think I see blue underneath the yellow laminate?!" Sure enough someone at some point around 1984-1985 when commando came out put the yellow laminate over the original blue Pooyan paint! I was happy that I finally found my Pooyan after several years of searching, it's a rather difficult original cabinet to find. All this time it was only about 10miles from my house! Again time to dig out some parts that have been sitting for a few years. Next up was to flatten the side art that was sitting in a tube rolled for a few years. You should flatten out the side art for any arcade machine that's been sitting in a tube for a while, this will help when applying to the cabinet. Another unique feature that this particular cabinet has is a slide out draw on the bottom which holds the PCB, Power Supply, Wiring etc. Also this game along with other Stern games features a "Bent Marquee" design. This allows you to place screws directly into the marquee itself without using a metal bracket which majority of marquees used. It gives it a floating design, and looks neat without having to use the upper bracket to hold it in place.